I stumbled across this little, locked hole-in-the-wall in Dinkelsbühl, Germany. However, I found no key to let him out. Locked for protection against vandals? He looks sad to be behind bars..perfectly shot. Individually, the statue and gate are beautiful. Combined is even better! We have a lot of those small statues around here,and in Italy too, but they usually are Virgin Mary, not Jesus. 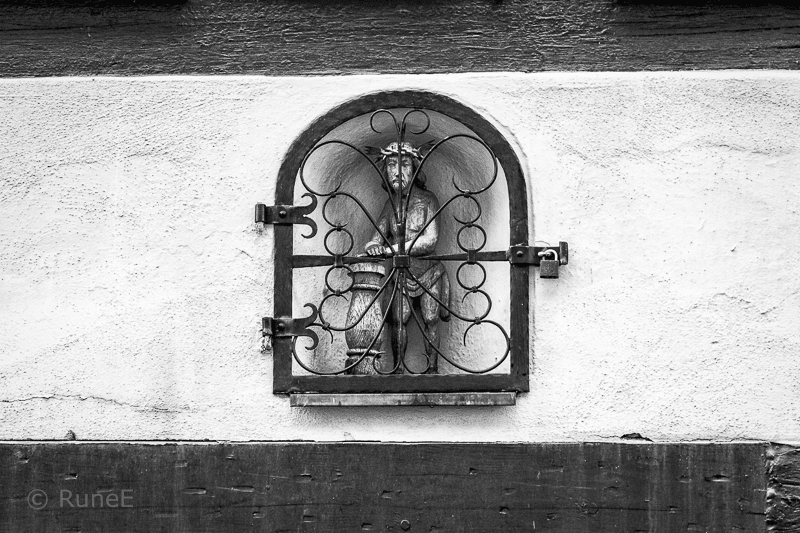 This statue is unusual, not the fact that it's in a cage.And they're often high on walls. A different statue indeed! You do find interesting things in your world!! And a great capture as always, Rune!! Hope you have a great weekend!! Enjoy! In German it's very frequent to find Jesus.I like this one. Wish you a nice weekend. Funker flott i breddeformat selv om hovedmotivet har høydeformat i seg! Perfekt å konvertere til B&W med dette bildet, strålende resultat! He does not look happy about being behind bars. You could have slipped him a file at least. Very interesting placement of that artwork. Lovely shot of it-brings out the curves and details in that sculpture very well. men en riktigt fin bild i B&W! I like the hole in the wall. Great capture. Poor guy, he looks so sad, which is intensified by the b&w format. Great choice. I think others had tried to let him out as there is a modern day lock keeping him in now. What a beautiful and special photo! Good job! A sign of the times - that all sacred things need to be guarded. At least the "cage door" is a lovely design, with enough spaces to appreciate the figure. Lovely photo. Får nesten litt vondt av han karen her, stakkarn! Flott sett og komponert, og perfekt i S/H! The bars make me feel sorry for him. Great shot.,Very well safe guarded. Never seen a locked statue like this before. He looked sad. What heartless person would lock a poor little chap in there! Very curious. Great compositon in B&W of this special object! Wonderful job! Hehe, du får jammen med deg mye rart, du! Kjempekult og godt fanget, Rune! I love the design of the gate - like a butterfly. The figure behind is rather strange! So he is still in there…waiting. What a strange little sculpture. Kind of weird, kind of spooky. Good subject for black and white. Great shot! I love the composition - so nicely framed by the dark bands at the top and bottom. A fun little detail that is perfect for black and white. Nicely composed and captured.